Phyto Phytomillesime Cleansing Care Cream 75ml is a cleansing care specially formulated for the color-treated and highlighted hair. - Red Love Apple, acts like a defensive shield that protects the hair fiber and locks in color. - Edelweiss extract, known for its anti-oxidant properties, provides soften and soothe. This care cream cleanses gently your hair and scalp. It protects and provide extra care without weighing hair down. Apply to dry hair, from roots to tips, one section at a time. The gel-in-oil texture immediately absorbs into your hair. The gel seals scales, while the oil protects the hair fiber. Leave on for 1 to 2 minutes, then wash hair with either the PHYTOMILLESIME shampoo or Cleansing care cream, alternating between the two. Elvive's Arginine Resist X3 Hair Cream is the first anti-wrinkle hair styling cream specially des.. Description:Formerly known as Phyto 7 Daily Hydrating Botanical Cream.Leave-In TreatmentPhyto 7 Hydr.. Description:A lightweight beauty cream for hair that keeps medium-to-coarse, dry hair looking beauti.. 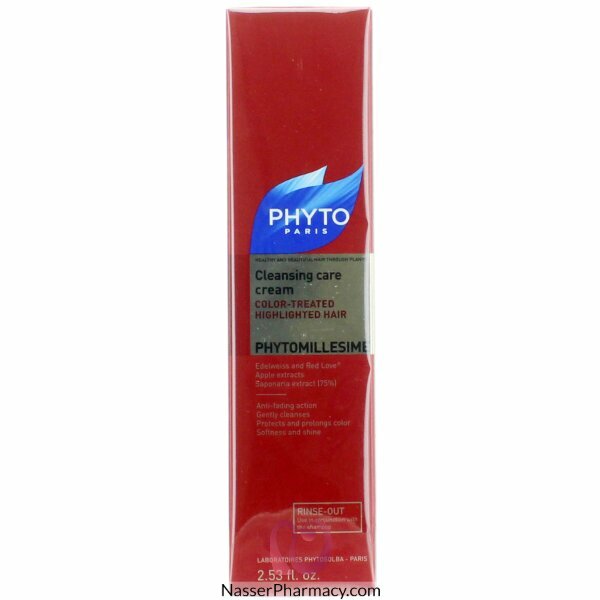 Description : Phyto Phytomillesime Cleansing Care Cream 75ml is a cleansing care specially formula..